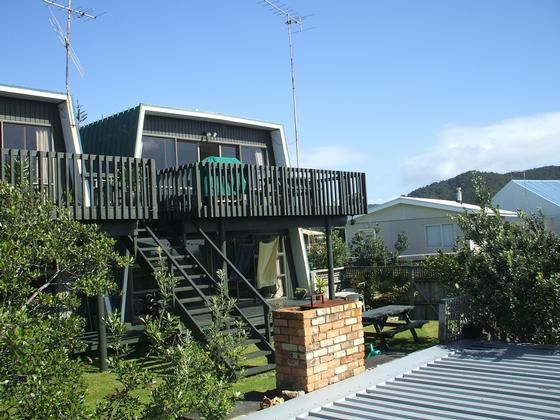 Enjoy spectacular elevated views of Mercury Islands and Cuvier Island while enjoying beautiful Whangapoua beach in our casual and friendly environment. Twin house property with relaxed owners next door. Houses separate in all respects including spacious north facing deck area at front and sunset deck at rear. Great location, very close to beach and shop. Excellent fishing and diving, good boat ramp. 40 min walk to nearby New Chums beach. 20 minute drive to Coromandel Town - Ferry service between Auckland and Coromandel available through 360 Discovery. No smoking indoors. Min 2 nights stay. 7 nights minimum stay during xmas holidays. Deposit required to confirm booking. Confirmed bookings from the 20th Dec, until end of Jan require 5 wks cancellation prior to the 20th Dec, or all deposits will be non-refundable. All other times require 3 weeks cancellation notice. No bookings to be requested on behalf of teenagers. Cleaning can be arranged with owners if required. A fee will apply. Wonderful place to stay. Just perfect location to store and beach.Owners lovely people and very easy to deal with. Locateion is amazing and property is lovely and clean and tidy, and the owners were great to deal with. Beautiful views, big rooms and conveniently located! Great location, clean and tidy bach. Great location, clean and tidy bach. Thank you for a wonderful stay! Great property near the beach.